Spring is harvest time for both strawberries and rhubarb and there is no better way to celebrate their arrival than to make a Strawberry Rhubarb Pie. While at first glance they may seem an unlikely pair, they really do go wonderfully together, with the sweetness of the strawberries balancing the tartness of the rhubarb. I love the look of this pie too, with its golden brown lattice crust that lets us have a peak at the glistening fruit beneath. Aah Pies. How we love them. Whether eaten plain, with a scoop of vanilla ice cream, or dollop of whipped cream, they are the quintessential American dessert. Yet, despite our love for them, we tend to shy away from making them at home. I think the problem lies in making homemade pastry. I must admit, making pastry does take a little practice, but once you master it, you are set forever. So for the novice, you could start by using a store bought pie crust. Then, as your confidence grows, try this pie crust recipe, which has a wonderful buttery flavor and crumbly texture. It is easily made in the food processor, just remember that the butter and the water need to be very cold. Once made, the pastry must be chilled until firm. The tricky part is rolling out the pastry. In order for it to roll out smoothly, without it sticking to the counter or tearing, it has to be at the right temperature. Too cold (it will tear), too warm (it will stick). This "feel" for the dough will come with practice, so don't get discouraged if you have some trouble at first. If the rolled out pastry tears a little as you put it into the pie plate, just patch it. 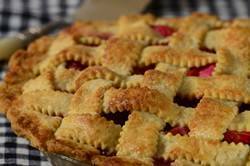 Now, the top crust of a Strawberry Rhubarb pie has a lattice design which is made by cutting the pastry into strips. Then the strips are laid evenly over the pie, half the strips in one direction and then the rest of the strips are weaved over and under the bottom strips. This makes a beautiful lattice design which also serves the purpose of allowing the bubbling fruit juices underneath the crust to evaporate. This is particularly good when using a fruit that is quite juicy, like strawberries. Lastly, the filling consists of strawberries and rhubarb, with a little sugar for sweetness, a touch of ground cinnamon for flavor, cornstarch for thickening, and a little butter. Since strawberries contain so much water, and they do shrink during baking, cut them into fairly large chunks. Rhubarb, on the other hand, should be cut into one half inch (1.5 cm) chunks and it does not need to be peeled. Once the pie is baked there is always the temptation to cut into it right away. Resist if you can. Fruit pies need several hours to set so that when you cut into them the fruit is juicy but these juices will not run. Excellent plain but even better with whipped cream or vanilla ice cream. meal (about 15 seconds). Pour 1/4 cup (60 ml) water in a slow, steady stream, through the feed tube until the dough just holds together when pinched. If necessary, add more water. Do not process more than 30 seconds. After the dough has chilled sufficiently, remove one portion of the dough from the fridge and place it on a lightly floured surface. Roll the pastry into a 12 inch (30 cm) circle. (To prevent the pastry from sticking to the counter and to ensure uniform thickness, keep lifting up and turning the pastry a quarter turn as you roll (always roll from the center of the pastry outwards).) Fold the dough in half and gently transfer to a 9 inch (23 cm) pie pan. Brush off any excess flour and trim any overhanging pastry to an edge of 1/2 inch (1.5 cm). Refrigerate the pastry, covered with plastic wrap, while you make the filling. Remove the second round of pastry and roll it into a 13 inch (30 cm) circle. Using a pastry wheel or pizza cutter, cut the pastry into about 3/4 inch (2 cm) strips. Place the strips of pastry on a parchment paper-lined baking sheet, cover with plastic wrap, and place in the refrigerator for about 10 minutes. Make the Strawberry Rhubarb Filling: Place the cut strawberries and rhubarb in a large bowl. In a small bowl mix together the cornstarch, sugar, and ground cinnamon. Remove the chilled pie crust from the fridge. Sprinkle about 2 tablespoons of the sugar mixture over the bottom of the pastry crust. Add the remaining sugar mixture to the strawberries and rhubarb and gently toss to combine. Pour the fruit mixture into the prepared pie shell. Sprinkle the fruit with about 1 teaspoon of lemon juice and dot with 2 tablespoons of butter. Place the pie plate on the hot baking sheet and bake the pie for about 35 minutes and then, if the edges of the pie are browning too much, cover with a foil ring. Continue to bake the pie for about another 10 minutes or until the crust is a golden brown color and the fruit juices begin to bubble. Remove the pie from the oven and place on a wire rack to cool for several hours. Serve at room temperature with softly whipped cream or vanilla ice cream. Leftovers can be stored in the refrigerator for about 3 days. Reheat before serving. This pie can be frozen. Editors of Cook's Illustrated. Baking Illustrated. America's Test Kitchen. Brookline MA: 2004. Sax, Richard. Classic Home Desserts. Houghton Mifflin Company. New York: 1994. Walter, Carole. Great Pies & Tarts. Clarkson/Potter Publishers. New York: 1998.